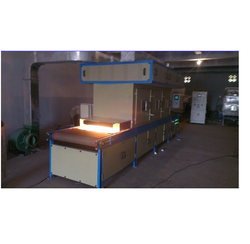 Pioneers in the industry, we offer tunnel ovens from India. Tunnel Ovens offered are designed for use different range of existing conveyor systems and can function as electric, gas, and steam heated units that have operating temperatures from 650C to 6500C. Further, these are designed to include support points for conveyor systems with the option of adjustable silhouette dampers provided on oven end openings so as to minimize heat loss. Further, each oven comes designed for specific application and includes multiple heat zones and cooling zones with options of units to be provided in sections so as to achieve easy installation and mating with existing conveyor system.